For years I resisted having either a personal website or a blog. Although I enjoy sharing my writing, having a blog seemed entirely too self-absorbed for my tastes. If I have learned anything in life it’s that you can’t look for personal worth externally, as in: “look at me, look at me”; you have to look deep within. While blogging I’m trying to walk a fine line between sharing material openly while trying to avoid being egocentric. On my trip around Iceland I was surprised how much I enjoyed sharing the daily details of my trip on a blog. I have been sharing my expertise for years on the Qajaq USA forums, so this is really a natural progression. I am looking forward to having another medium to share my writing, thoughts and images. Some experiences are really better shared. In 2007 I left the corporate world and the mindset that I was living for retirement — to start living for today. While it’s always wise to prepare for the future, life is what happens between the big plans, vacations and retirements. In the corporate world I had money but precious little time for anything more than a 2 week trip. For years I had yearned to pursue kayaking “expeditions” and other adventures (I also plan to through-hike the Appalachian trail). I knew that I would have deep regrets otherwise. In 2010, with the economy doing poorly, I got back into computer consulting. This time around, I’m happy to have the income, although I do miss having weeks off (or more) to pursue long trips. Living simply sounds noble, but it is nice to have disposable income for some luxuries, new kayaks, a car when needed, and money for the little emergencies that come and go. Having now lived with an abundance of time to travel / modest income and just the opposite, I now have a better appreciation of each lifestyle, and what you gain and lose for each. Life is a balance but often life changes can often involve swinging far to the far left or right of where you want to be (e.g. income versus time), and then trying to move toward the center again. Rather than smooth movements in one direction, if you resist change, change will still happen, only it will happen in dramatic shifts (“earthquakes”) rather than minor adjustments. Greg is the past-President and founder of Qajaq USA, the American Chapter of the Greenland Kayaking Association (Qaannat Kattuffiat). Greg is best known for his study, teaching and writings of Greenland technique and culture. 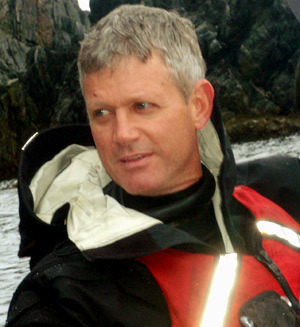 He has written articles for Sea Kayaker magazine and authored the chapter, “Using Greenland Paddles” in “Eastern Arctic Kayaks, History, Design, Technique” by John D. Heath and E. Y. Arima. Greg is a featured paddler in Justine Curgenven’s “This is the Sea” video, and is a guest-instructor in “Nigel Foster’s Sea Kayaking Series”. A minimalist by nature, Greg was attracted to Greenland-style kayaking and began learning Greenland skills in the late eighties. He credits the late kayak historian, John Heath, and six-time Greenland champion Maligiaq Padilla, as his primary mentors. In 2000 he attended a week-long training camp in Qoornoq, Greenland and learned from some of Greenland’s best kayakers. Greg participated on the first American team, when the annual Greenland Kayaking Championship was opened to outsiders in 2000. He won his age group in the World Class (which combined all Greenlanders and foreigners), and earned medals in different disciplines, including long distance racing and rolling. Greg returned again in 2002 and earned another gold medal for rolling. While there he enjoyed kayaking in several locations along the Southwest Greenland coast in a traditional skin covered kayak; “The Greenlandic coast and fiords are truly soul-inspiring in their beauty. Works of man are few, and the immense landscape both humbles and empowers you at the same time”. Greg loves to teach and is a much sought-after coach for symposiums, across the USA and worldwide. Greg has instructed in the United States, Israel, Japan, Spain, Sweden, Great Britain, Canada and New Zealand and looks forward to traveling and teaching in new locations. In addition to “Greenland-style”, Greg enjoys kayak surfing, rough-water kayaking, flatwater racing (k1), surfski paddling/racing, some whitewater, and trips of all kinds. Greg has pursued multi-week trips in many locations, including the Pukaskwa coast of Lake Superior, the Apostle Islands, circumnavigating Isle Royale in Lake Superior, portaging his sea kayak across Isle Royale (to fish the inland lakes and to hear wolves and see moose), exploring the coastal areas of the Florida Everglades, and more. In June 2007 Greg and Freya Hoffmeister circumnavigated Iceland (1,620 km) in 33 days (25 paddling days), a record. Greg paddled an NDK Explorer and used a carbon Superior Kayaks Greenland paddle on the trip. In June 2008 Greg circumnavigated Newfoundland solo (2,102 km) in 44 days (35 paddling days), a record. Greg paddled an NDK Greenlander Pro and used a take-apart carbon Superior Kayaks Greenland paddles on the trip (86″ and 88). In 2013 Greg won his class as the first solo kayak to finish the 300 mile Everglades Challenge, a 300 mile expedition-race from Tampa to Key Largo. Greg raced using an Epic 18X kayak with an ONNO Endurance wing. Don’t get too serious about kayaking unless you have storage room — or take up running instead (shoe storage doesn’t usually require a bigger garage). Eventually many kayakers obtain as many kayaks as golfers have clubs as they all have a different purpose. Following is a partial list of the boats in my arsenal (this doesn’t include old frames, etc) . I have more paddles of various types than I care to mention. VCP Anas Acuta (as seen in “This is the Sea”).